Merry was a lovely, gentle, big doe, much nicer than this picture can show! She had a very long rump, extremely level rump from thurl to thurl, and an udder that stood the test of time. I wish I had added her to my herd years earlier! 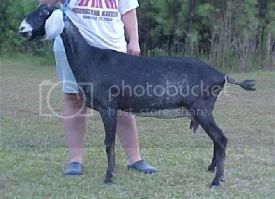 She thrived on milk test, appraised well for an aged doe and we were especially thrilled to have her earn her Superior Genetics in 2011. Merry kidded easily for the last time in 2012 with twins does by Ksstdemur's Ghengis Khan, one of which is doing well in the herd. Merry earned her retirement- she roamed the property during the day, snacking on rose bushes, manzanita and pine trees and basking in the sun until she died quietly in 2015. 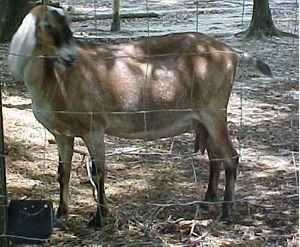 Babe passed her best characteristics- a wide, flat rump; clean, straight legs; beautiful rear leg angulation; dairyness with a butter soft udder texture and easy to milk teats; and a 'look at me' style down to her sons, daughters and granddaughters. Every daughter on DHIR has earned her milk star and their Superior Genetics designation. One daughter, SG Aja-Sammati Grand Sophy 3*M was on the ADGA Top Ten for production, butterfat & protein in 2009 and for production & butterfat in 2010. Babe sons are also stamping their daughters with correct mammaries, elegant style, long bodies, and plenty of milk production. Shauna has been a very slow maturing doe. She has a very smoothly blended fore-udder and an excellent rump. She milks easily from very properly placed teats and milks down to nothing. Her production is not impressive, but she has very good butterfat and a very persistent lactation. We love her angularity, elegance and style- and her very productive daughters! Shauna is bred to Pruittville's Epoch Legacy for March 2013 kids.